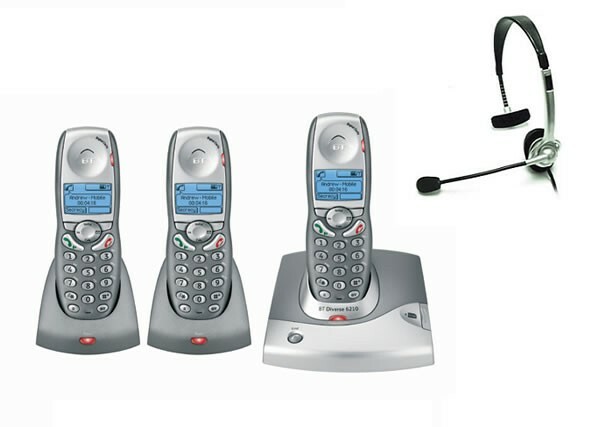 The BT Diverse 6210 Triple DECT cordless phone with SMS text messaging and SIM card reader has a backlit four-line LCD and the call clarity of a corded phone with an easy menu operation handset. Fully GAP compatible, it can be used with other BT Diverse products and is ideal for many applications including domestic, home/office or organisations needing a small phone system. AlarmClockCall timerConference calling (multi handsets)Call transfer (multi handsets)Handset ringer volume controlBase station ringer volume controlPaging facilityKeypad lockDigital handsfree speaker phoneHeadset includedLast number redialSMS text messagingMessage Indicator LightEarpiece volume controlPreparatory diallingSIM card readerBacklit displayTalk time - 13 hoursStandby - 170 hoursRange - 300 mName and number directory - 100 namesCall list - 20Ringer melodies - 15SecrecyMute buttonPagingContrast controlCopy directorySimultaneous internal and external callsHandset namingBase PINThe NRX JAC Telephone Headset has been designed to work with most DECT telephones and is also compatable with some mobile telephones (check your telephone specification).